So far I have not seen an Icom 7610 Fldigi RigCAT file. I modified an IC-7600 file and it works. So, if you’d like to try Fldgi the easy way with the Icom 7610, have a look. Otherwise, I have another article using ACLog and Fldigi which also works very well. Fldigi can be used with some simple macros and it’s easy to send personalized messages. The Icom 7300 is very similar. 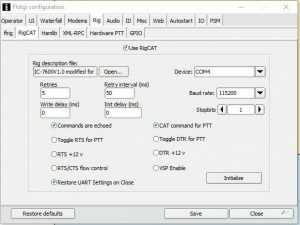 It was very simple to make an Icom 7610 RigCAT file. All that was needed was to change the CI-V address in the IC-7600 file. That way you don’t have to change the CI-V address in the radio and mess up other programs you have working with the IC-7610. You can download the modified file HERE. When they come out with an IC-7610 .xml, I’ll switch over to it. In case you’re wondering, they already have an .xml file for the Icom 7300. The easiest way I have found to use Fldigi is with RigCAT and using the log in Fldigi. I can import the Fldigi log into my favorite logbook later. I like using Fldigi for PSK31 and the default macros are a good start. I edited them just a bit to suit my needs and station. 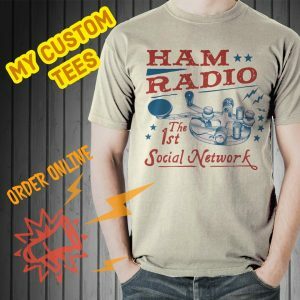 A lot of Hams like to have a “RST/QTH” macro and “Brag” macro to send just so they don’t have to type those things over and over. That’s my preference too. I normally use a QSO start and QSO end (KN) macro during the contact. My personalized message is typed in between those two macros. 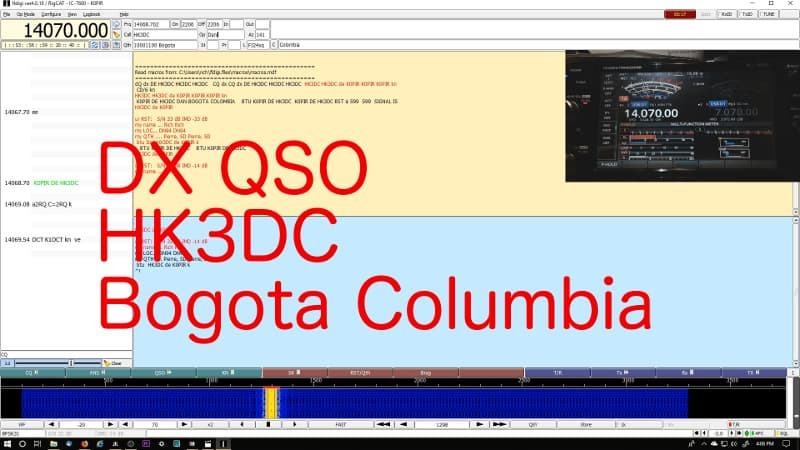 Have a look at the video below and I make an unexpected DX contact on PSK31 using 30 watts. Who said propagation is poor, HI! In this video I’ll go over two of the important Fldigi configure tabs, my output power, macros and some receiver settings. Don’t forget to see my Icom 7610 Screen Captures page for more internal settings on the Icom 7610. Coming up next I’ll have a video and closer look at the Elk antenna along with a look at satellite tracking software. Also, an end fed random wire QRP antenna. Thank you for subscribing to this website. I appreciate the comments, questions and suggestions. Please follow me on Twitter, Facebook, Instagram and YouTube if you have those. 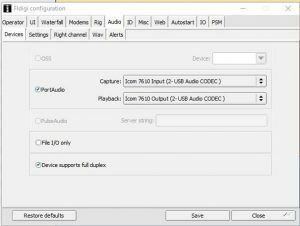 I very carefully put in all the settings on the radio…no problem there…BUT when I followed the instructions for installing the drivers, then connected the usb lead….went to Device Manager and opened ports, I was expecting 2 lines of “Silicon Labs CP210x USB to UART Bridge” each with its specific COM number. 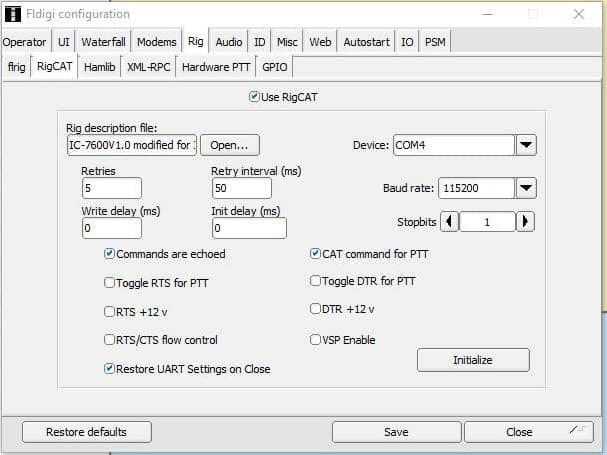 Instead I have 2 lines of “CP2102 USB to UART Bridge Controller” (current date)with no port numbers. As a result HRD etc. is not usable. In a word, HELP! First, is the USB cable plugged into the correct port on the rear of the IC-7610? 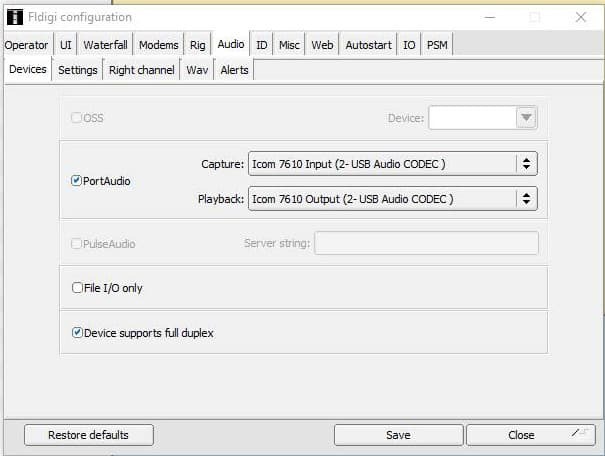 There are two ports and you do not want the blue port (USB3.0) that one is for HDSDR. You want the USB2.0 port. Did you download the driver from the Icom website? The latest driver for the Icom 7610 v1.20 is HERE. If you need to you will have to uninstall and install the correct driver. The instructions are HERE. I would check the port first.